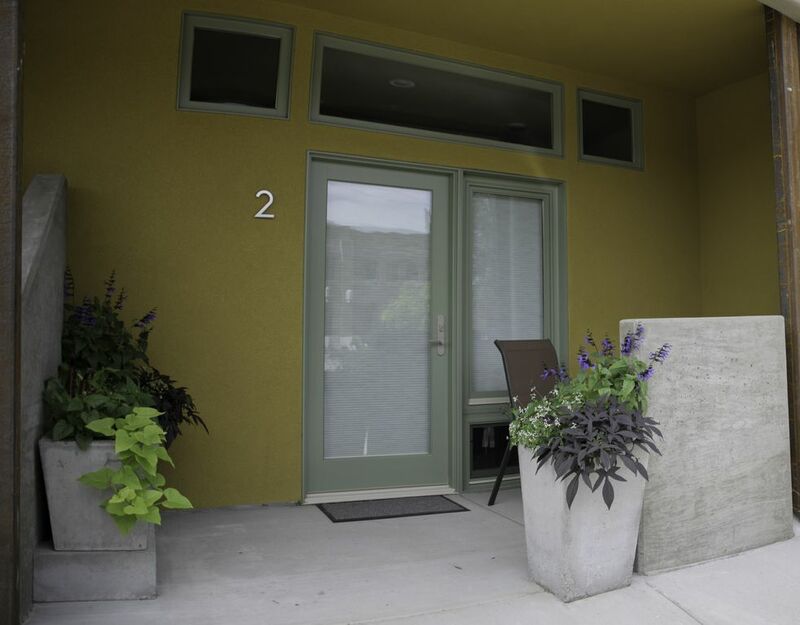 The Center Street Suite #2 is a lovely, centrally located spot to spend your vacation. At approximately 300 sq. ft., this suite is much bigger than most hotel rooms, has its own entrance from the street with a private patio area and is very quiet. The luxurious bath has a large walk-in shower, the bed is king sized, and the closets spacious. For your enjoyment a flat screen TV with cable and WIFI should fit the bill and the separate locked bike storage area will keep your valuable rides safe and secure. The mini kitchen has a fun, retro styled, fridge and microwave, plus a coffeemaker and dishes, enough for simple food prep if you don't feel like going out to one of our many great local eateries. Need more room or is this condo rented at the time you want to visit? Check out the matching suite next door, HA#479166 and the larger condos in back, HA#367670 and HA#149341. The Center Street Suites are located in the heart of downtown Moab in a very quiet location within easy walking distance of many restaurants, bars, shops, etc. Large retro style bar fridge with freezer compartment. This unit was not built specifically to be wheel chair accessible but there are no steps. The Moab Aquatic Center is only four blocks away. They have indoor and outdoor pools. Great location! Perfect for walking downtown. Awesome spot! Perfect for two. We spent one day at Arches then walked around that night in downtown. Super location and great accommodations. The bed was so comfy and the shower was great too! Thank you! We enjoyed our stay at this location which consists of two rooms: living room/bedroom and a bathroom. The location is within easy walking distance of great morning coffee (at 7 AM) and a fine Thai restaurant practically next door. Parking is ample and usually directly in front of the residence. Very quiet. This studio was perfect for my husband and I for a quick getaway. It was super clean, the bathroom and shower were spacious, and the bed, couch and tv were top notch. You are able to walk everywhere in downtown Moab but the studio is off Main Street so it's not loud. We would definitely come back and visit! 1) a very very central and excellent location for wandering about town 2) the owner was extremely gracious. I made a mistake and thought I had booked 3 nights, not 2, and she was able to accommodate us and was quite nice about it. My wife and I visited Moab for our fall get-a-way trip from the kids. This spacious (quiet) efficiency apartment met all of our needs. The location is awesome. Wonderful communications with the owner. The owners made us feel welcome.